On Saturday I ventured to the hills above Sonoma to look at a near million dollar home that I thought would be fabulously fun to write about. The posting for the open house read: owner died in home in 2016. Being January 2016 meant the owner had only been gone a short while. I wanted to see if I could feel the spirit or see any trace of the other world. I did not. The house was too sweet and cared for and the realtor has an relationship with the deceased. It felt best to not write any more and leave the recently departed at peace. I drove away with my friend in tow. She had pointed out an Open House on our way to the Sonoma home and thought we should stop in. The listing had not been on my radar which made me curious. The driveway for the home was an abrupt turn from Sonoma Highway. Up a short driveway a decorative wrought iron gate stood half-opened. It was not clear if we were welcome; a fully opened gate would have been more desirable. A dirt road rutted and muddied by the winter's rain forked as we descended a small hill, the garage and home were to the right and an unofficial parking area sat left. I parked and observed all Open House signs had disappeared. Was the house really open? The warning signs caught my attention next. The classic 'Beware of Dog' sign had been tacked on a pole near my car and at another location in the distance. It suddenly felt like a "Scooby-Doo" episode. My friend warily walked on, "Hello?" she yelled. Thankfully a man who I assumed was the realtor appeared. "Is the house open?" I asked as we approached the front door. "Yes of course!" He greeted, then rapidly told us the home's stats. As he spoke a dog barked. My friend and I both looked around as the kind realtor spoke. He was not phased by the barking dog. I couldn't concentrate on one word the realtor spoke because the barking would not stop. "Come in, Come in," he begged. The dog sounded too close to move any further. I asked, "Is the dog in the house?" "No, no. The dog's under the house." He waved his hand toward an ankle level vent. It was now obvious where the barking came from. My friend and I now felt comfortable and entered the home. The house with glazed orange ceramic tile floors was open and the kitchen seemed modern enough. Some of the beds had not been made which was odd for an Open House. A redwood lined creek in the backyard was the property's highlight. The homeowner had poured a large concrete slab between the home and the creek; one could easily envision joyous outdoor parties in this scenic local. As the three of us chatted on the rear deck. The realtor started pointing out the property boundaries and an old barn, I looked off to my left. A mean German Sheppard-like dog glared at the three of us standing on the deck. The realtor kept talking, and soon the dog appear off to my right, still leering and now growling under its breath. I had seen enough. My friend and I thanked the realtor for his time and said good-bye. "I'm trying to talk the owner into dropping the price," he yelled after us as we sprinted to the car, now aware there was a dog on the property and he apparently didn't like hosting an Open House. When I started this Open House blog, my intention was to produce one entry a week. I look at open houses on Sundays and could commit to writing a blog post soon after. But today, I happened upon a flash sale. It was a dreary Tuesday morning. The sun did not want to come out and the cold nipped. I did something I hate doing and went to Costco. Surprisingly Costco was a dream and I was out of there with my eggs, milk and other unforeseeables in less than 30 minutes. At a major intersection near my home I saw numerous 'Open House' A-frame signs screaming to be noticed. It was a Tuesday, not a Sunday so the number of signs was unnecessary, but worked.With my new commitment in mind I followed the signs and found an open house to peruse. The house had little curb appeal. The color was nondescript and the circa 1960's ranch home seemed blah (or as my kids later said 'meh'). This turned out not to matter however, because the home's true appeal was the huge backyard with a beautiful outdoor kitchen complete with a barbecue, fire-place and ample counter space protected by timber beams wrapped in canvas. Beyond the outdoor kitchen the yard stretched left and right with a flagstone steps that lead to another outdoor living room. An orange tree sat heavy with fruit at one end of the yard and red hens protected by a quaint hen house stood at the other. The yard was huge (and marvelous). The price and unusual day for the open house begged the question. Why today? Why so much? My friend was with me and asked. "Because they're under contract to buy another home and need to sell." Was the answer. While it was not called a flash sale, it felt like one. The listing even called it a 'hot' home meaning: this will sell fast! Don't delay in making an offer. The home on Rancho de Sauna was a 'hot' home, but was not identified as such. Perhaps 'hot' is in the eye of the realtor or the home owner wanting it to be so. I did learn something new on this Open House Tuesday. Freshly baked chocolate chip cookies do not overpower the smell of new carpet and paint. I literally saw the realtor take the cookies from the oven and chatted with him as he plated the fresh baked treat and I could not smell a thing; odd but true. Perhaps baking cookies should only be a trick used when the home owner has not spent money to paint and re-carpet. The for sale sign was tacked to the front of the house as if it were a used car on the corner. The house stood at the end of a cul-de-sac and the stark green and white 'HOUSE FOR SALE' sign above the orange garage could not be missed. It was efficient, but odd. An aged wooden staircase lead from the driveway to the front door. The double doors stood wide open where a realtor and two Greek goddesses greeted visitors. "Welcome!" said the jolly grey man as he handed out the fact sheet. I soon learned the realtor hailed from San Francisco, a place where signs tacked to the outside of buildings was not so unordinary. The Greek goddesses stood tall in the living room, holding lamp shades high and saying nothing. I roamed the large tri-level house. The main level had a kitchen, dinning room and living room. 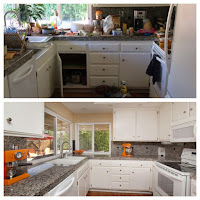 The kitchen had a recent(ish) update with granite counter-tops and rosewood cabinets. This room was the only modern room in the house. The rest of the house was stuck in 1980, the year the home was built. Standing at the kitchen sink, I admired the large kidney shaped pool outside. Earthen stairs marched up the hillside away from the pool. The realtor noticed my observation, "the lot's almost half an acre-- there's a garden at the top." I shook my head and wandered away. To get to the backyard you have to go down a half level through a huge family room with thick soft lint caked carpet. The backyard was my destination, but then there were clowns. Six framed portraits of clowns hung around the perimeter of the room above a navy blue sectional couch. The clowns smiled and grinned, I did not. The clowns changed everything. I hurried through the rest of my visit. The bedrooms rooms upstairs were sparsely furnished and the bathrooms were original. I thanked the realtor and continued my Sunday. Compared the the Ranch de Sauna house I saw last week, this home was not a steal. It was not move in ready and would be much work to purchase and update. The floor plan and large lot were huge pluses, but the dank smell and dated ambiance (and perhaps the clowns) would be hard to overcome. Divorce. The realtor said it was divorce and it made sense. The house had been impeccably remodeled starting with the master suite. The suite had a huge walk-in closet, a separate cedar lined closet and an added room with a Japanese style tub and sauna. The remodel continued through the other bedrooms and bathrooms, then made an abrupt stop at the kitchen. Yes, divorce. Too many arguments over too many details I suppose. The house was also priced to sell. The asking value was mind blowing, considering the beautiful master suite, the huge lot (almost 1/2 an acre), and artist studio (I forgot to mention that part). I've been to many open houses and this was the first one where I audibly heard the word 'offer' from every party milling about the beautiful house. This place was a steal. I've been on a kick this past year. I'm addicted to open houses. Every week I look at the Sunday Real Estate section or scan my Redfin ap to scope out the open houses I need to see. I've seen homes obviously used for marijuana cultivation (strong stench and excessive security cameras) and incredible old estates that must've been the bees knees in the 1960s. The past year has been a blast. There's a new plan for the new year. I will feed my addiction and keep looking at open houses every week, then I will review, remark and comment on the homes I visit. This will inspire me to go, do and see. The exercise may also show off some fun real estate in Sonoma County and perhaps you'll move here and we can share a glass of wine someday.